A couple of months ago my stars were aligned in favour and I had the opportunity to spend a week with Hal Taylor at his Rocking Chair University! 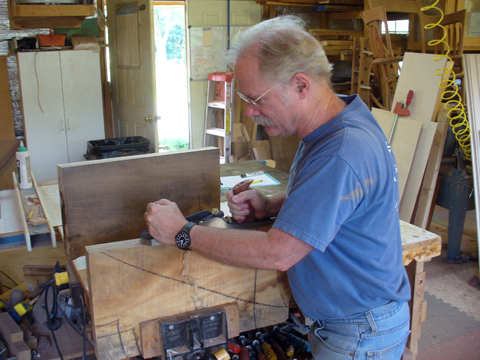 Hal has built almost 300 rocking chairs over the past 15 years and his attention to style and detail has led him to become internationally known for his quality workmanship. 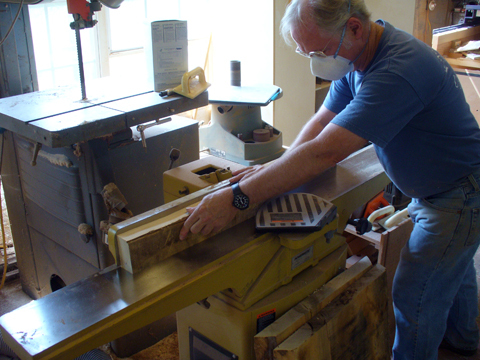 Influenced by both Sam Maloof and James Krenov Hal approaches his woodworking as he does life -with patience and in harmony. 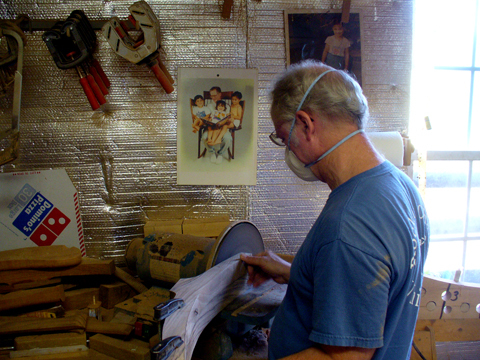 He crafts his unique chairs from the finest of woods and builds each one to be cherished for generations. 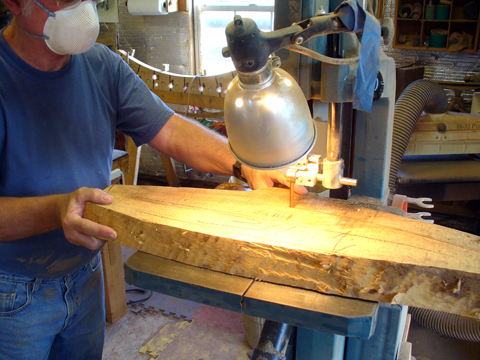 Hal has also taught hundreds of woodworkers to build their own chairs, many of whom have gone on to starting their own business building and selling rockers. The Rockingchair University gives you the chance to spend a week with Hal, observing the building of one of his fine rocking chairs. Because the buyers of these chairs expect them to be handcrafted by Hal himself your participation is limited to observing, listening and helping with sanding and small tasks. 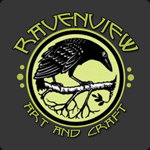 Nonetheless, you walk away with a wealth of rocking chair building experience, a manual, templates, the confidence to build your own and above all, a great friend! 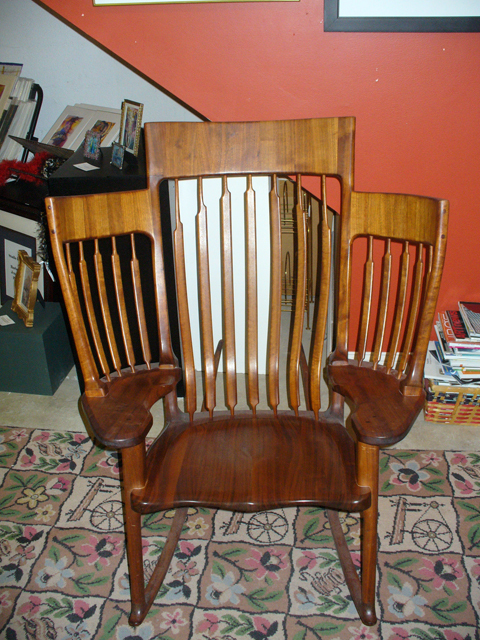 You can view more of Hal’s fantastic chairs here at his website. Fast forward a few years and one day while surfing the Internet looking for chair plans I happened upon Hal’s website. The memory of the magazine article quickly jumped to mind when I once again saw a picture of this chair. Even with several months of projects on my ToDo list I was hopeful that I was getting close to building a chair, something that I have always wanted to do. At this point I still didn’t know what type of chair to build but as soon as I saw Hal’s chairs and the fact that he offered plans and was willing to share his experience I knew that building a rocking chair was in my near future. 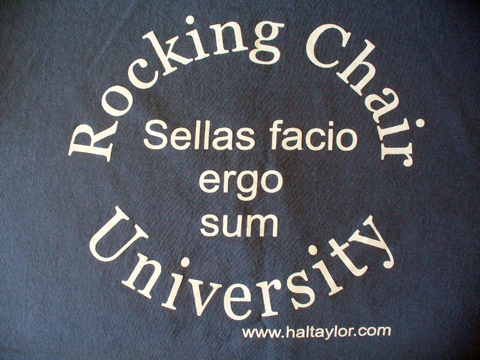 I contacted Hal and after exchanging several emails he invited me down to attend his Rockingchair University. Here was an offer that I couldn’t turn down! It was agreed that I would visit the second week of September. On the morning of my ‘first day at school’ I arrived at Hal’s shop and I was met outside by his dog Buddy. After inspecting me thoroughly and a bit of ball throwing I was allowed to enter the shop. When I entered the shop Hal was busy organizing and straightening up, preparing for the week ahead, and after exchanging introductions and pleasantries it was quickly clear that I found a kindred spirit. First, there was the classical music playing, a mainstay in my own shop. Then there were the clamps! Clamps, clamps and more clamps! 🙂 Seriously, from the moment I walked into the shop I knew that this was where I was supposed to be. Hal explained that he planned a special project this week, something different than his traditional rocking chairs. He wanted to make a prototype of a smaller rocker based on a chair that he made a few years ago so this week we would be ‘trialing and erroring’ a new design. 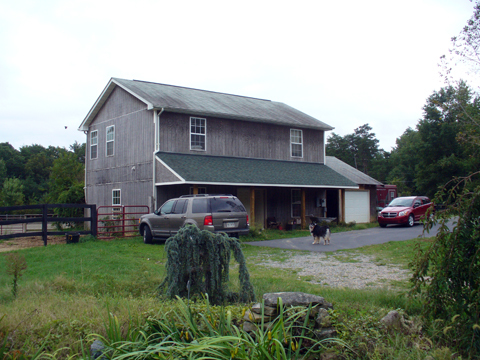 This was going to be exciting, to be right here in on the design stage and through completion! Not one to waste time we quickly got to work. 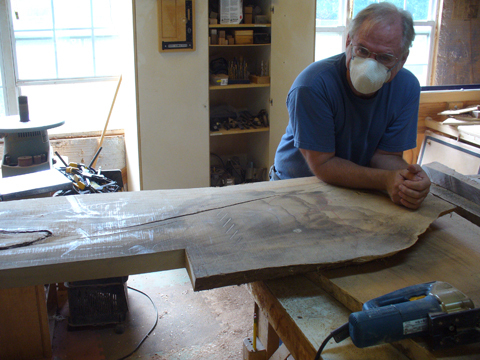 The first thing was to get several large slabs of English Walnut from the lumber pile and bring them over to one of the workbenches. 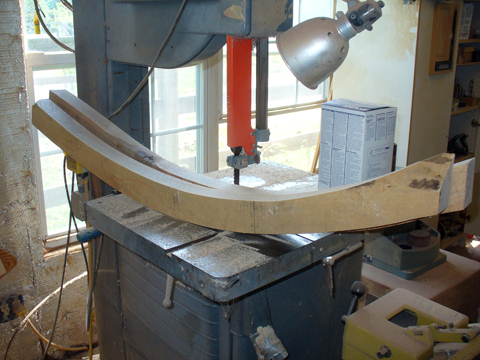 To ensure the integrity of the wood Hal cut of a couple of inches off one end and then cuts off a piece about 1/2 inch wide. Then he strikes this piece repeatedly and at different places looking for flaws. Once the quality of the wood is verified we spend some time deciding on the best grain patterns. 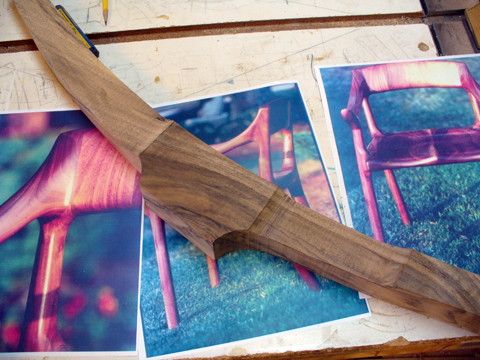 Then using his time tested patterns the required pieces were marked on the wood. 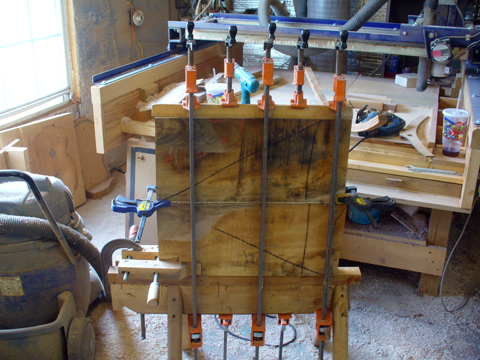 Once the seats were planed they were glued together and then clamped tightly in a clamping jig. 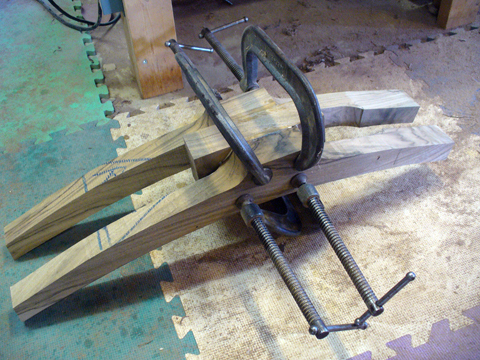 Hal ‘wiggles’ the clamps to find their ‘sweet spot’ before final tightening. This minimizes shifting during glueup. When gluing pieces together he uses Titebond III for gluing dark woods and Tightbond II for gluing light woods. The color of 3 dries dark and 2 dries light thereby minimizing the visibility of a glue line. Once both back legs were finished to this point they were glued to a ‘stack’ piece. Differing from the Maloof style chairs ‘stacks’ are used where the legs meet the seat and headrest on Hal’s chairs to give a greater radius on the curve thereby making the flow of chair more graceful transition. Once dried the legs will be sawn down the middle of this ‘stack’. When I die bury me in my shavings!